On July 16, Amazing Grace: Jeff Buckley is screening at the Memphis Brooks Museum of Art in conjunction with their Annie Leibovitz: American Music exhibit. MOJO Magazine names the best 100 modern classic albums, and Grace is #1. Some good news: Amazing Grace: Jeff Buckley won Best Documentary -and – Best Film at the DIY Film Festival in LA! Lemme tell you, D.I.Y. music licensing is no F.U.N. – so the DIY stamp of approval is especially satisfying… also because the indie spirit of this film is a big part of its overall message. Thank you to Rich Martini and the DIY judges! In celebration of the DIY ethic, we’ll be screening Amazing Grace at the DIY Convention (Do It Yourself In Film, Music and Books) this Friday in LA. Next week we’re screening Amazing Grace: Jeff Buckley at the San Francisco World Film Festival. Laurie will be in town to answer questions after the screenings. Go to our NEW website for all the screening and ticket info. C’mon down! Here’s a doc at SFW Festival that we can’t wait to see. Ocean Odyssey documents director and musician, Paul Gilman, communicating with whales and dolphins using an electronic keyboard and Native American flute – they go CRAZY. Some of the most noted cetacean biologists have joined up with Gilman’s expeditions because he’s achieved the closest human contact with a pod of killer whales and captured the first underwater footage of orcas and dolphins together. The trailer will give you goose bumps. 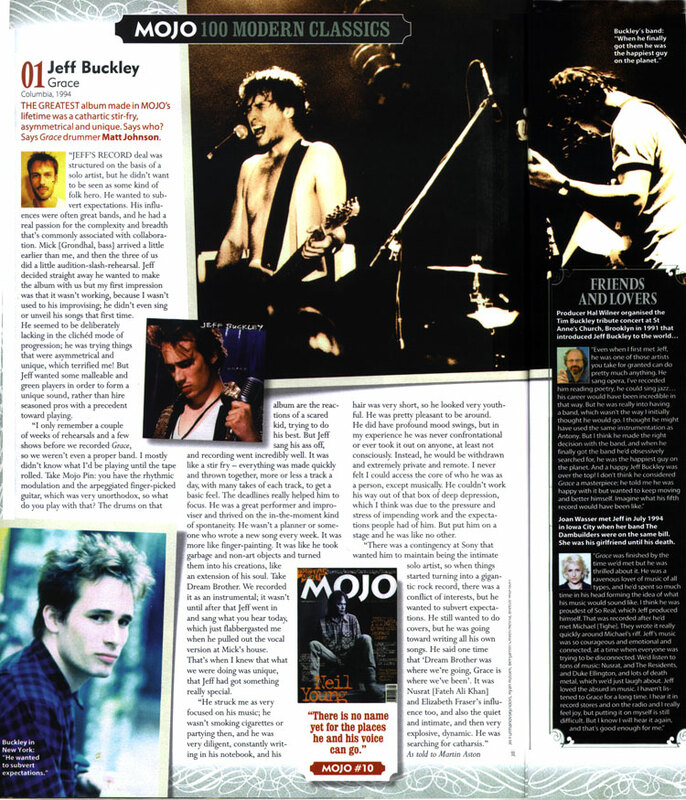 Read a review of Amazing Grace: Jeff Buckley in the June/July issue of PASTE Magazine. Also, the folks at Fungible Convictions interview us about the making of the doc, lost interviews with Polly Jean, and Jeff breaking fast with Siouxsie and Budgie. Walk, don’t run. Tickets now available for screenings of Amazing Grace: Jeff Buckley at the CineQuest Film Festival in San Jose, CA. C’mon on down for the double feature. We’re screening with Phil Di Fiore’s documentary short, Stranger: Bernie Worrell On Earth, which just opened at Slamdance last week. Our documentaries are a perfect pair because we both have colons in our titles, and because both films appreciate under-appreciated musical geniuses. (see tagline: Beethoven, Ellington, Hendrix… Worrell?) Interviews for the Worrell doc short include: Mos Def, David Byrne, Prince Paul, and a bunch more intriguing chaps. The AG:JB + S:BWOE screenings will be held Wednesday, March 9 at 7:15 PM (Camera 12 Cinemas) and Saturday, March 12 at 5:15 PM (SJS University Theatre.) Be there. Jeff Buckley’s Grace (Legacy Edition) was released in the UK today. For the time being, you can watch the music video for the infamous, Forget Her, which was replaced last minute by the song So Real when Grace was released in 1994. I think Jeff had said somewhere that he removed the song because he didn’t want to play such a sad song, night after night. Since he’s not around to play it anymore, the decision was made to release it on the legacy edition. The song is lovely, the video, haunting. I’m assuming Columbia put this together recently using disparate footage and outtakes, but it certainly works. Most definitley better than the video for Everybody Here Wants You.